The week before Christmas I received an advertising brochure in the mail from my local Ralph’s Market with coupons and appetizer recipes. 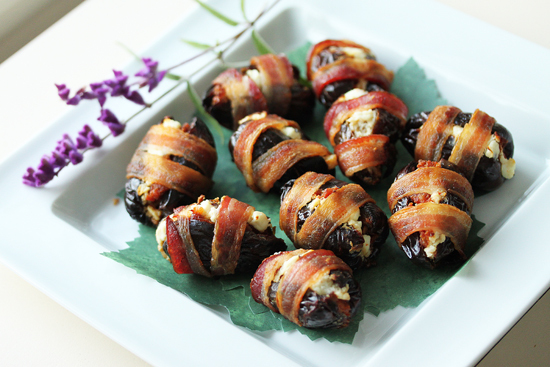 The photograph that accompanied this Bacon Wrapped Date recipe was taken really close-up, and if you didn’t know what it was, you never could have guessed. But the bacon was shiny with oil and the primitive part of my brain recognized meat with fat, compelling me to read the recipe. 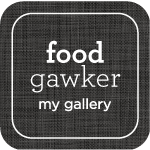 I already had the goat cheese from an appetizer I didn’t get around to making for my Christmas feast, and I had the Mulay’s Chorizo frozen from when I made the Chorizo and White Bean Soup. All I had to get was the dates and bacon. No problem. 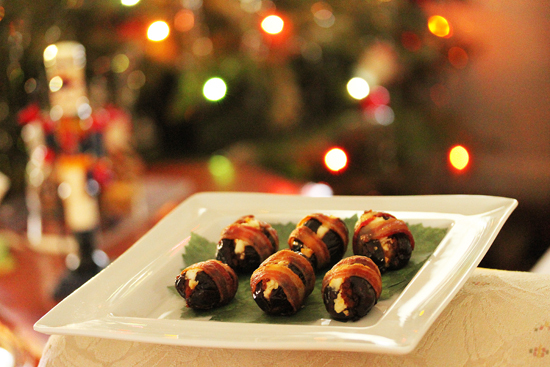 I imagined how the four ingredients, Medjool dates, goat cheese, chorizo and bacon, would taste together and decided I had to make it. Sweet, spicy, salty, creamy, smoky. Oh yes. The Medjool dates were slit open and the pits removed. Very sticky. But meaty and luxurious. I halved the bacon lengthwise, but next time I may cut it crosswise. I know I will be making these again because they disappeared really fast. I had them on the serving plate covered with plastic wrap and first it was, “What are those bacon wrapped things in the fridge?” Then, “When can I have one?” Then, “Are you done photographing those bacon wrapped things yet?” When I finally released them for consumption, there were two left for me. Sheesh. 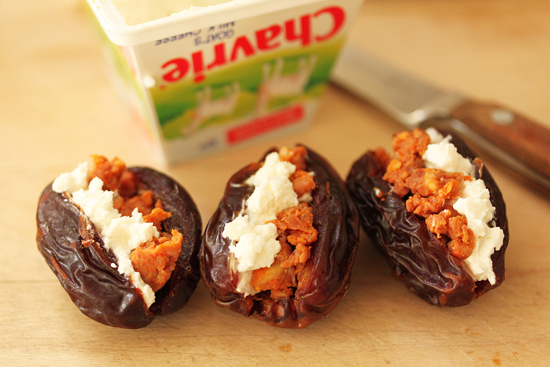 Each date is filled with about ½ tablespoon each of chorizo and goat cheese. It is an awkward job to fill them… the stuff falls out… but persevere, because it is so worth it. 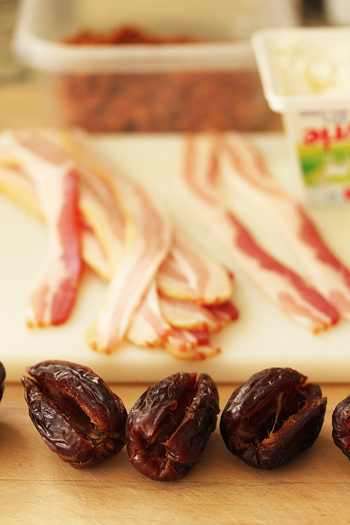 The best way I found to wrap the bacon is to place a strip of bacon flat, then set a date in the middle. Pick up one end of the bacon and wrap it around and under the date, then pick up the other end of the bacon, wrap it around and under. Set the bundle with the ends of the bacon on the bottom, so it holds them in place. I taste tested them as soon as they came out of the oven and had cooled a little, but they were pretty soft and and too hot to really taste the ingredients. I also burned my tongue in my gluttonous haste. They were refrigerated over night and I next tried them cold. Whoa. So much better. But at room temperature they really sang. A veritable jazz trio of flavors and textures. Soft and crunchy. Caramelized sugar from the dates. Sweet tangy goat cheese. Chewy smoky salty bacon. Spicy chorizo. You get the idea. You must make these! So what was I talking about Christmas bokeh? What is bokeh anyway? Well, I knew what it looked like, but I didn’t know it had a special name. Bokeh is the appearance of the out of focus points of light in the background of a photo. Actually, anything out of focus in the background is called bokeh, but points of light are the most beautiful. I learned the term bokeh when I was reading a post about photography on Pioneer Woman. Then I googled and got Wikipedia and Ken Rockwell with detailed information and examples. Christmas trees and lights give great bokeh and I was very excited to see if I could create this effect. I think my photo turned out pretty cool. 1. Preheat oven to 450 degrees F. Line a baking sheet with parchment paper or foil. 2. Cook the crumbled chorizo over medium heat until no longer pink. Drain on paper towels. 3. Slice each date halfway through lengthwise down one side. Open far enough to remove and discard pit. 4. 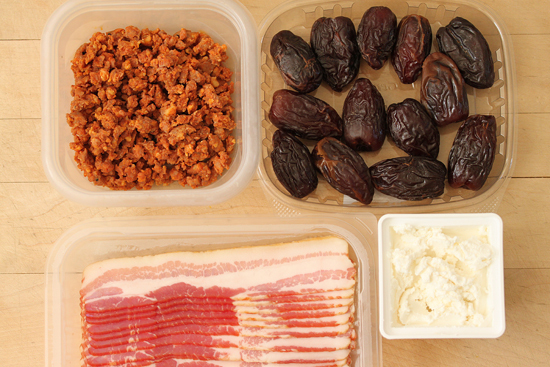 Fill each date with about ½ tablespoon chorizo and ½ tablespoon goat cheese. 5. Cut each bacon slice in half lengthwise. 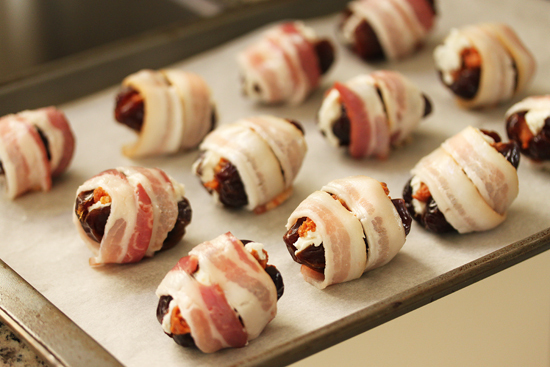 Wrap each filled date with one bacon strip, going around 2 times. Set date on baking sheet with both bacon ends on the bottom. 6. Roast 10 to 14 minutes in oven until bacon is cooked to desired doneness. 7. Serve warm, room temperature or cold. Refrigerate any leftovers. Wow, I just got back from date tasting at three date farms in the Palm Desert Coachella Valley area. They specialized in Medjools and had lots of other kinds too. Didn’t see anything like this though!!! Fabulous photos! I am going to make these for sure! Wishing you a wonderful 2012! These are just begging to be made on NYE! 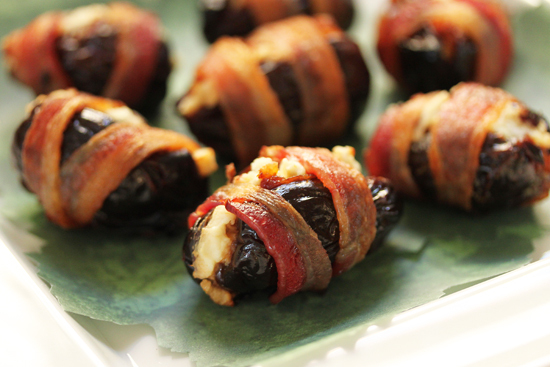 We used your recipe to make these as one of the appetizers on our restaurant’s Valentine’s Day menu. I was hesitant to serve them at room temp, but I trusted your advice (and I did taste them and loved them that way). Everyone who ordered them raved. Someone even mentioned them almost a week later at a charity event we were doing saying how they loved them. We’ll be doing them again as a board item (too much labor to put them on the menu). 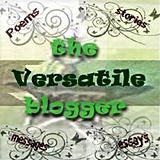 Thanks again, and I love your blog! Thank you for posting this recipe, it is one of my all time favorites! Exploring your website & blog was so enjoyable, I laughed and nodded as I read your comments, recognizing what havoc gluttonous haste can cause and will be frequenting your site for sure. Happy Holidays & thank you! !